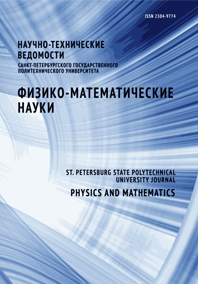 Kharkov Nikita S. Petrichenko Mikhail R.
The Crocco boundary problem is more convenient than the Fourier limit problem when either is applied to the transfer problem of passive and conservative tracers for a number of advantages given below. Firstly, the concentration density distribution is generally sought on the standard compact interval from 0 to 1 in the distribution class of the limited growth instead of a semi-infinite interval. Secondly, the dual variational formulation of the problem being equivalent to the marginal one is admitted, and it reduces the solutions topology from C(2)(0, 1) to W2 (1)(0, 1). Thirdly, there are simple invariants of the solution which are convenient for estimating the solution norms and have a simple interpretation for moments of the density distribution. And finally, the Crocco boundary problem is “insensitive” to the nonlinearity of the equation coefficients. In this problem with piecewise-constant coefficients boundary conditions on the contact within the (0, 1) interval of variation in the density distribution are equivalent to the transversality conditions. The paper presents the demonstration of these arguments and the solution examples of the limiting problem for the Crocco equation with a power variation in the transfer coefficient.